Boston College students might have to find a different bar to drink at this weekend, because the Boston Globe reports that Mary Ann's is under threat of closure at midnight tonight due to its failure to install a sprinkler system. Sprinkler systems are required to be installed in all bars as a result of legislation enacted following the fire at The Station club in Rhode Island that resulted in 100 deaths. The state legislation required installation by November 15, 2007, but local fire officials were allowed to extend that deadline by one year. Eight bars or clubs in Boston have reportedly not yet met the deadline. Mary Ann's is often-cited as one of the top dive bars in Boston, to wit: "...The official BC let's-get-drunk-and-throw-rocks-at-cops dive bar." I think I know the real reason that the owners of Mary Ann's are dragging their feet on installing a sprinkler system: if the sprinklers ever were to go off, then the place might no longer have sticky floors or that gentle fragrance wafting out the door. Update: The Allston-Brighton TAB reports that a manager at Mary Ann's says that they have now completed installation of the new sprinkler system and it has been inspected, clearing the way for the bar to remain open. Image of a sticky bar floor in Brighton (UK) from Phillie Casablanca provided through a Creative Commons license. Living in a dense, urban environment results in substantial airglow that inhibits seeing all but the few, brightest stars in the night sky. Those who think the night sky particularly bright in Allston-Brighton might have a new explanation: glowing, radioactive beer kegs. Abandoned medical scanners, food processing devices and mining equipment containing radioactive metals such as cesium-137 and cobalt-60 are often picked up by scrap collectors and sold to recyclers, according to the International Atomic Energy Agency, the UN's nuclear arm. De Bruin said he sometimes finds such items hidden inside beer kegs and lead pipes to prevent detection. Image of beer kegs by marinegirl provided through a Creative Commons license. In a sign of the direction that the youth vote took Tuesday in the presidential election, the pre-kindergarten through first-graders of Brighton's Baldwin Early Learning Center voted more than three-and-a-half-to-one for Senator Barack Obama over Senator John McCain. Senator Obama's victory margin at the Baldwin ELC was very similar to his margin among adults city-wide, which he won 78.9% to 19.4%. The kids voted at around an 80% rate, better than the adults city-wide who had a 61.6% turnout of registered voters. A bigger landslide was registered at Hamilton Elementary School. There were no lines of voters snaking out the door at the school. The secrecy of the ballot was maintained -- i.e., nobody wrote their names on the top of their ballots. No provisional ballots were cast, nor did election officials request IDs from any of the student voters. Only around 10% of the kids' ballots were declared invalid (by the first-graders acting as the election workers) as overvotes -- a remarkably low number since more than half the voters were pre-kindergarten students. The students clearly learned a lot about the basics of voting and elections. Next they plan to vote on a referendum dictating the flavor of milk to be served in the cafeteria. 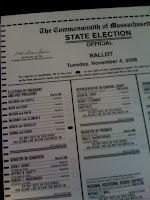 Image of ballot cast for Obama cribbed from http://modadimagno.blogspot.com/. 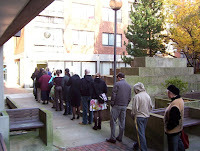 Polling places this morning at various precincts in Allston-Brighton all had long lines of voters snaking out the door. Lines of around 30-50 people were observed at all precincts visited, which include Ward 22/Precinct 8, 22/9 [both top at right], 21/12, 21/10, and 21/11 [bottom at left]. The wait at 22/9 was around 15 minutes at 7:15 am. 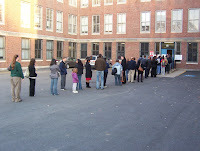 I've never seen lines such as these in Allston-Brighton (certainly not at 7 am), where turnout is typically quite low -- 11% in the November 2007 municipal election, around 5% in the September 2008 state primary, and 32.2% in the February 5, 2008 presidential primary. Students from local colleges and universities were seen at 22/8-9 conducting an exit poll about people's election experiences -- such as, were you asked to show an ID, were you on the registered voter list, etc. Note that these exit polls are a student project, not the official media pool exit polls which also ask for whom you voted. I spoke with, or overheard, a significant number of people who identified themselves as first-time voters at 22/8-9. Long lines also reported over at the Jackson-Mann Community Center, which is the polling place for five precincts (Ward 21/3-7). Free Coffee. Don't forget to stop at any Starbuck's today to pick up your free tall coffee. Just tell them that you voted today. Image of Starbuck's logo by miskan provided through a Creative Commons license. Tuesday, November 4th is a general election in Boston, which includes the offices of President of the United States, U. S. Senator and Representatives, the state legislature representatives and senators, three state ballot questions... and always a few other positions that nobody seems to have heard of. Voter Information Guide. A good guide can be found over at the BostonZest website. League of Women Voters (Vote411) has a thorough guide detailing everything you need to know about voting. Note that a few A-B precincts changed their poll locations last year -- and I haven't heard that any more have changed this year; here's the list from last year. Not On the List of Registered Voters? If you go to a polling place and your name is not on the list of registered voters -- but you believe that your registration may still be current -- then request a provisional ballot. You vote now, and then the elections officials will sort it all out later. First-time voters should be prepared to bring an ID with your current address on it; otherwise, bring some mailed bill (gas, electric, cable TV) with your name and address on it. If they won't give you a provisional ballot, then call the City of Boston Elections Department at 617-635-3767 and they will "gladly assist you." When to vote? Polls open 7:00 am -- 8:00 pm. Voters who are in line by 8:00 pm are allowed to vote, no matter how long it takes to process through the queue. Local Election Results? At the City of Boston's Current Elections website. Want to Blog on Your Voting Experience? Universal Hub has a website for you to enter the address where you voted and your experience with it. Image of optical scanner machine by .michael.newman provided through a Creative Commons license. Christopher Connolly, 42, of 28 Harbor View St., Dorchester, and Scott Simonelli, 37, of 7 Pleasant St., Dorchester, were arrested Oct. 26 around 6:30 p.m. after officers saw what they believed to be a drug exchange near the intersection of Washington and Cambridge streets... Officers stopped the Nissan and arrested both suspects, charging them with distribution of a class B substance. A couple of guys from Dorchester caught selling drugs in Brighton. What's so weird about that? The Boston Police D-14 station is located at the intersection of Cambridge and Washington Streets in Brighton. You would think that all of the police vehicles parked on the street and in the adjacent lot would have tipped the guys off. Maybe those Dorchester pushers ought to go back to their part of town where they know the lay of the land better. Image of Boston Police motorcycles by GregMacKay, provided through a Creative Commons license.